Thought Number 1 Why do I like Cows? Why do I like cows? Why does anyone like cows? In fact, why does anyone like anything? I guess these things are written into the landscape of a life, in the places between where you come from and where you end up. Sometimes you get to choose those places and sometimes not. Cow love started quite early for me. I think I’m now trying to channel my younger self, though my jeans are not quite as short. 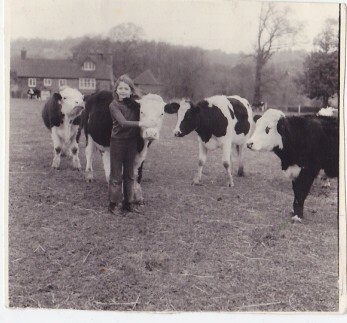 Back then I was clearly smitten, pictured here with a neighbours steers. The one I’ve got my arm around is Billy, and we struck up quite a bond for a few months. Maybe it was because I was lonely having moved to an unfamiliar home and he showed interest, but I remember the intensity of my affection. He was curious and playful and made me laugh by trying to lick me with his raspy tongue, yet he also seemed sad. My parents kindly didn’t tell me his eventual fate, saying vaguely when the time had come for his slaughter that he had been ‘moved.’ I don’t remember being hugely upset by his absence but I’d probably made some human friends by then and was busy exploring the countryside after our previously suburban life. But I always held that thought – that one day I would have some cows of my own. Maybe if we’re ever lost or worried we should look to the things that made us dream.